A high heel shoe is pushed into a new flexible transistor developed by researchers from Japan's National Institute of Advanced Industrial Science and Technology (AIST) and the Japan Science and Technology Agency (JST). A paper on the transistor was published in Nano Letters. The flexible transistors can take a serious beating and can even be laundered along with clothing, according to the researchers from the National Institute of Advanced Industrial Science and Technology (AIST) and the Japan Science and Technology Agency (JST). 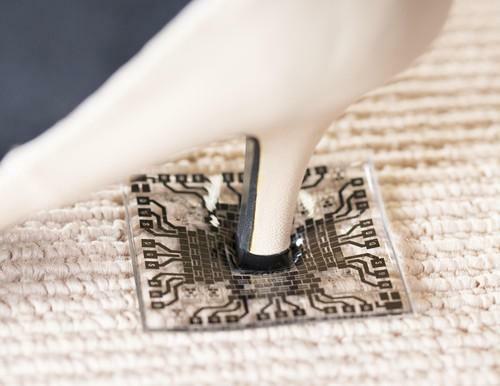 Possible applications include embedding the transistors into clothing to monitor health signs, as well as using them for the basis of synthetic sensitive skin covering humanoid robots. All electronic devices developed so far contain brittle materials such as metals and thus cannot live up to the natural softness and flexibility of clothing, AIST researcher Atsuko Sekiguchi and colleagues wrote in the journal Nano Letters. With the aim of creating a transistor made entirely of supple materials, the eight researchers embedded a rubber matrix with carbon nanotubes, a super-strong conductive material that has recently been used as the basis for a new nonvolatile memory. The resulting material consists of hydrocarbon polymers and long single-walled carbon nanotubes arranged in a network structure. It retained both the electrical conductivity of the nanotubes and the softness of rubber. The researchers produced the transistor in a variety of designs, including a circle with a concentric arrangement of channels. It has 110 percent elasticity and will still work even after being hammered, run over by a car and stepped on with high-heel shoes. "Although previous reports have demonstrated one or two aspects of robustness, our aim was to develop a wearable device that could tolerate all the 'punishments' our clothes experience, for example, stretching, bending, and twisting, as well as compression, impact and laundering," the researchers wrote. "To date, this level and diversity of robustness have never been reported for any electronic device." The transistor could be used in "health monitors, wearable communication devices, robotic skins, and so on," Sekiguchi said via email. It would be difficult to estimate how much the device might cost, the researcher added. While use in wearable computers has been a major focus of flexible electronics, the concept has also been applied in other ways, including health-monitoring sportswear and brain implants that can directly monitor and stimulate cells.